To celebrate the semester’s first artist lecture, 3DMIN proudly announces three acts of experimental music. Tomomi Adachi is Japanese performer/composer, sound poet, instrument builder and visual artist. Known for his versatile style, he has performed his own voice and electronics pieces, site-specific compositions, improvised music and contemporary music works by John Cage, Cornelius Cardew, Christian Wolff and others in all over the world including Tate Modern, Maerzmusik, Centre Pompidou, Poesiefestival Berlin, Merkin Hall, Tempelhof Airfield, STEIM and Experimental Intermedia. He has performed with numerous musicians including Jaap Blonk, Nicolas Collins, Jon Rose, TAKAHASHI Yuji, Carl Stone, SAKATA Akira, Jennifer Walshe, Annette Krebs, ICHIYANAGI Toshi, Zbigniew Karkowski and OTOMO Yoshihide. CDs include the solo album from Tzadik, Omegapoint and naya records. He was a guest of the Artists-in-Berlin Program of the DAAD for 2012. 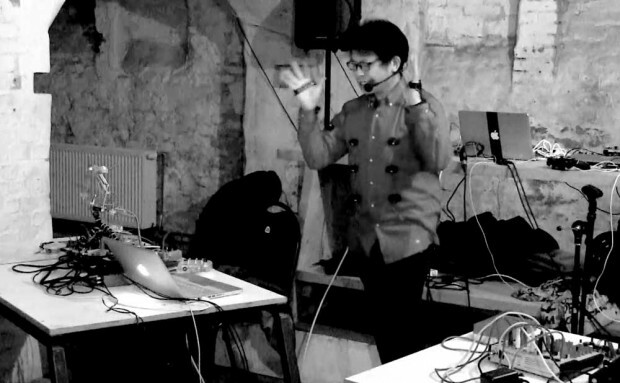 He presents his rare solo performance in Berlin with his self-made instruments and interfaces. Trio Brachiale plays improvised electronic/computer music with a wide spectrum of technological and musical approaches. Founded in 2010 in Berlin for a concert evening of the Society for Nontrivial Pursuits, it consists of Dominik Hildebrand Marques Lopes, Hannes Hoelzl and Alberto de Campo. Besides many gigs in the Berlin area, we have played at a number of international festivals, conferences and other events, at times with guests like Mario de Vega, Echo Ho, Wu Na, Jeff Carey and others. All the Trio members work at the Berlin University of the Arts, teaching computational art and doing research on hybrid instruments. Trio Brachiale explores the possibility space of multi-instrument setups, and the music one can make with them – from circuit-bent guitar pedals to boutique analog synths like the Blippoo box, and self-written synthesis programs played from controllers ranging from basic gamepads to the Manta to self-designed and -built controllers like The Finger and the Harmolodica. Trio Brachiale performances can range from strictest free improvisation, aiming for flowing communication with zero premeditation and -discussion, to having a software conductor giving the members cues when to play with which instruments in order to structure the evolving musical textures. Surprise and be surprised! Tobias Purfürst is a Berlin based producer/composer. His musical style covers a broad range of electronic music genres, from club tunes to experimental/conceptual compositions. One of his recent pieces is an improvisation, involving several sound generators, such as the Benjolin, No-Input Mixer and coil mic, competing with each other. Beside several collaborations and concerts with different musicians, his abstract solo work led him to play important places for experimental music, such as the ZKM, Feed and LEAP amongst others.